At Boyert Shooting Center, we are centered on education. If you have a question please do not hesitate to ask one of our highly trained staff members or contact us. Below is a list of some commonly asked questions and the indoor range rules. All firearms must be cased when entering the shooting range. Any of our rental rifles, shotguns, and full-auto firearms must be carried on/off the range by an employee. Do not handle rented or personal firearms in the lobby, retail center or anywhere else other than the range. Only case and uncase firearms at the shooting bench, especially long gun cases. After being uncased all firearms should be pointed down range at the backstop at all times. Eye and ear protection must be worn prior to entering the range and remain on for the duration of the time spent on the range. Do not pass a firearm from one shooter directly to another. Place the firearm pointed down range on the shooting bench and allow the next shooter to pick it up off the bench. Do not switch firearms from lane to lane unless they are unloaded and back in a case. The parent or legal guardian must sign a waiver for minors. If you have an issue with a firearm that you can not resolve leave it on the shooting bench pointed down range and notify a range safety officer for assistance. If you observe any unsafe conditions on the range report it to the range safety officer immediately. You may not draw from a holster unless certified by the BSC staff. Know how to safely operate any firearm that you handle. No food, drinks or tobacco is permitted to be on the range. Never use alcohol or drugs while handling firearms or on the range. Use only the correct caliber ammunition for your firearm(s). We do not allow steel core, tracer, incendiary, slugs, aluminum or steel cased ammunition to be fired on the range. Guest may collect their own brass from their stall. They may not collect brass forward of the safety line or in other shoot stalls. Boyert Shooting Center’s rate of fire policy is every round you fire must be controlled; however, there is no maximum rate of fire. Range safety officers have the right to ask any guest who doesn’t follow range safety standards to leave the range. You are responsible for your actions while on the range. Q) Do you offer instructions? A) Yes, Boyert Shooting Center offers private instructional classes for any shooter level. Please ask our Guest Service Specialist for more information or to sigh up for your private class. Q) How long does it take to rent a gun? A) At Boyert Shooting Center we want to make your experience as pleasant and enjoyable as possible. Renting a firearm is as simple as walking to our rental counter and selecting your firearm. Q) Why should I become a member? A) Becoming a member at Boyert Shooting Center will be on of the best investments you have ever made. We offer discounted pricing, early updates on the latest firearms being delivered, industry news and update and much more! Contact us today and sign up. Q) How much will it cost for the range? 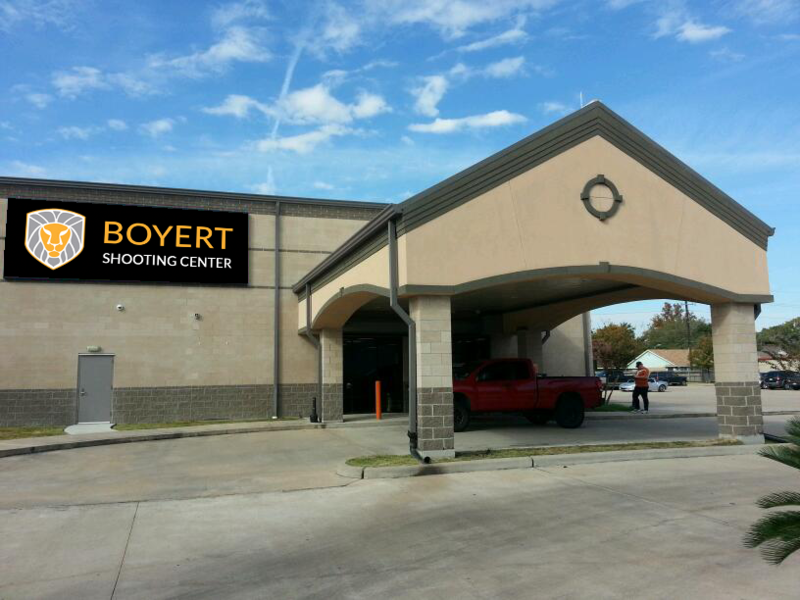 A) At Boyert Shooting Center, we offer the most competitive prices in the industry and for a Houston gun range. Range Fee – 60 minutes – $18.00. Rental fees can range from $12.00 to $35 depending on caliber and action. For more information on range fees, simulator fees or rental fees, please give us a call at 713.977.3000. Q) What makes Boyert's indoor gun range different? A) With our customers in mind, we’ve made gun safety and thoughtful amenities our highest priority. Come experience our indoor shooting range, perfect for those who want to practice their shooting skills in air-conditioned comfort, especially in our extended, hot Texas summers! We even have a high-tech filtration system in place in the shooting range, to quickly alleviate the smell of gun powder, making the shooting experience more comfortable for all. Q) Do you offer hunters education? A) Currently at this time Boyert Shooting Center does not offer Hunters Education Classes. Q) What if I've never shot a gun before? A) Whether you are an experienced shooter, or this is your very first class, you will find yourself right at home at Boyert. Our expert instructors will put you at ease, making every class informative and pertinent to your skill level. We hope everyone, at all levels, who visits Boyert will feel perfectly comfortable coming to classes in jeans and a t-shirt, making you feel at ease and confident in your newly learned skills! Highly trained range officers will ensure you enjoy this exciting sport in total safety. Strict safety procedures will be enforced at all times. Hearing will be supplied. Eye protection is not provided but available for purchase. Firearms are of the highest standard and fully maintained.